This App achieved an ORCHA score of 88%. The Diabetic Retinopathy Calculator (DRC) is designed for individuals with diabetes and it is the first mobile application available developed specifically for diabetic retinopathy. 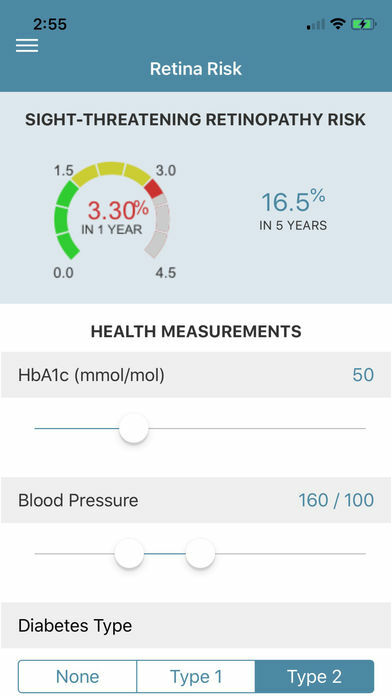 The application allows users to track and monitor their disease progression and get valuable information about their clinical condition. The Risk DRC calculates patient’s percentage risk of developing sight-threatening retinopathy over time. The risk estimates are based on each individual’s clinical data. Find whether you are in high or low risk for developing retinopathy. 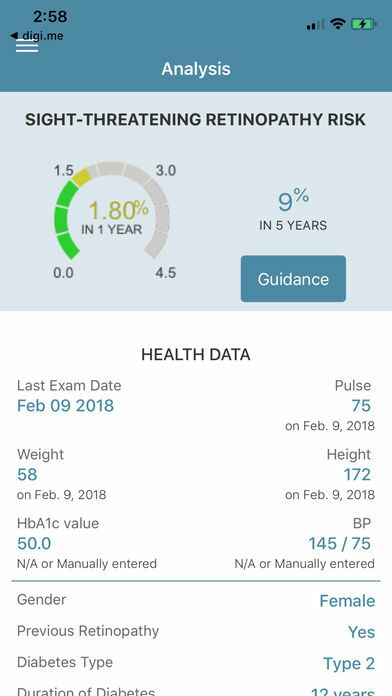 Find out what you should do to lower your risk and achieve target levels Track and monitor your disease progression over time Find educational information about diabetic retinopathy and related diseases See recommended interval until your next screening visit A score of recommendations is given based on each individual result. The recommendation may be used to improve the health of each individual. The application provides the option of logging results over time to view and monitor progression over time. 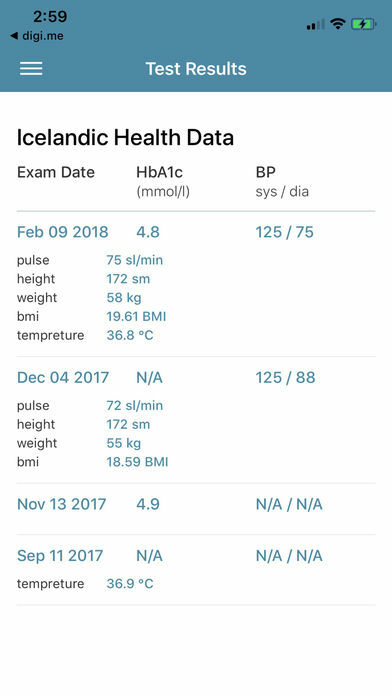 We recommend that this application be used every time an individual visits his endocrinologists or when they go for a screening visit. The company behind The Risk DRC application Risk Medical Solutions is an academic based software house located in Iceland with over 30 years of experience in screening for diabetic retinopathy and treating diabetes. DISCLAIMER: Please read the terms set out in this disclaimer. By accepting these terms and conditions you agree to this disclaimer and are deemed to be bound thereby in any event. 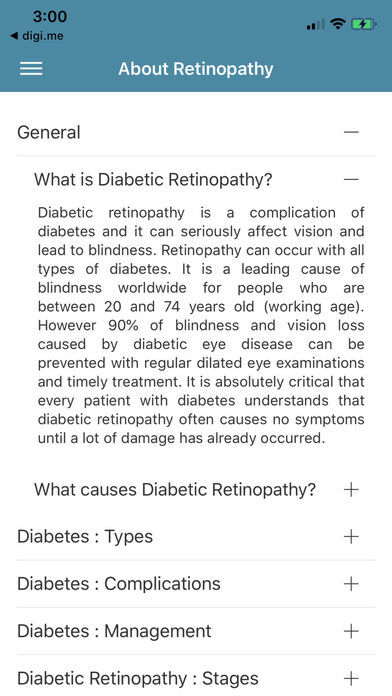 This disclaimer covers all use of Risk Diabetic Retinopathy Calculator mobile application (Risk DRC). This mobile application is solely a decision support device and should always be used as such. The outcome should be viewed as relevant information or recommendation but not as a final decision as made by a health-care professional. It is always up to a licensed health-care professional to make the final decision for future intervals of screening visits. Developers (Risk Medical Solution, Dattaca Labs, Onymos Inc and Digi.me) are not liable for any damages or claims set forth by users based on the usage of the application. We do not warrant that the mobile application will meet your particular requirements or that the mobile application will run uninterrupted or error free. Please see further information on our company and products on www.retinarisk.com NOTE: This RetinaRisk app requires DigiMe app (available in AppStore) to access personal health-care data to use with advanced features of this RetinaRisk app. None of your data is 'touched', 'seen' or 'held' anywhere outside of your mobile device by this RetinaRisk app. The App doesn't encrypt the information it collects to make it safe from other people as it is transferred from the App. The App doesn't encrypt the information it collects to make it safe from other people as it is retained by the the developer.